Chirply, the crowd-sourced and crowd-curated design community for paper goods, today announced that it has closed a $1.1 million series A round of investment. The round was led by a host of top angels and investment firms, including Netflix founder Marc Randolph, Sling Media’s Blake Krikorian, Keith Rabois of Square, Ash Patel of Yahoo, Dave McClure of 500 Startups, Y Combinator, and Founder Collective. Chirply will use the infusion of capital for product development and to ramp up hiring efforts. The design startup has also redesigned its website and launches the new iteration today. Since Chirply’s soft launch, which we covered in February, Chirply has attracted 200,000 pageviews, over 100 design submissions, and has already doled out its first payments to designers — according to co-founder Gagan Palrecha. Both he and his brother (and co-founder) Neel Palrecha wanted to use the growing popularity of online crowd-sourcing, he said, to breathe new life into the Hallmark-led paper products industry. And to do so in such a way that would be attractive (and lucrative) to designers. 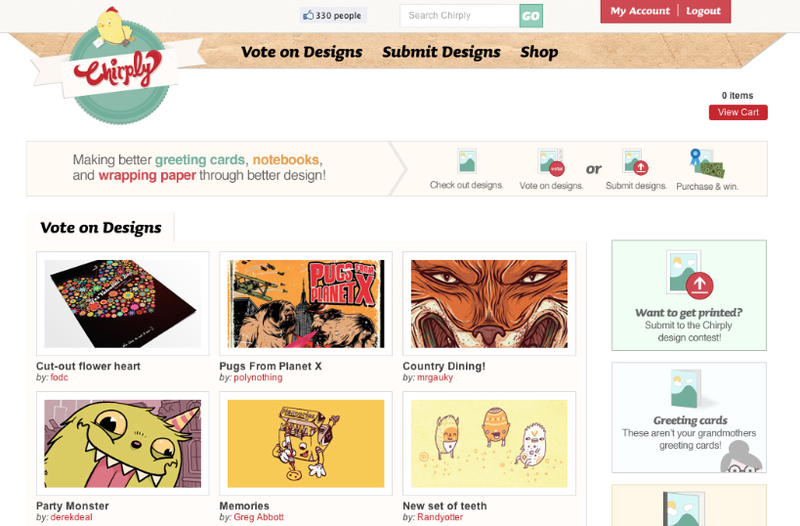 Chirply aims to be all about the designer, especially freelance and up-and-coming designers. As such, part of the startup’s redesign will be a renewed focus on its blog, where it will post interviews and feature popular designers. “We’re trying to do more to highlight designers”, Palrecha said. “We want them to have more exposure, so that they can generate more work and gain wider recognition — we really want to be a positive force in the design community”. In a very real effort to give back to the designers who create artwork for Chirply’s greeting cards, wrapping paper, and notebooks, Chirply is offering crowd-sourcing with a financial incentive. Members of the Chirply community vote on which designs are their favorite, giving the ideas that receive the most votes the opportunity to be made in print and the designers a chance to receive a $300 prize. Plus, designers will receive an additional 10 cents for each item that is printed with their design. Compared to Hallmark, which doesn’t accept unsolicited artwork for their greeting cards and pays their staff and commissioned designers a flat fee with no opportunity for royalties, Chirply is opening the playing field to budding designers out there looking to see their ideas brought to life. Chirply greeting cards will sell for $4 a piece and $25 for a set of 10; compare this to Papyrus, for example, which sells similar cards for $6 to $10. While Papyrus does offer a selection of cards for under $4, the cardstock isn’t of the same quality. What’s more, Palrecha told me that one of the site’s designers was already contacted by a large apparel company that saw their work on Chirply and proceeded to buy it. So, if Chirply can turn this kind of success from a single story into a commonplace occurrence, the startup just may be able to build a service that’s of real benefit to designers — and has a real presence in the design space. Lastly, Chirply will be giving all TechCrunch readers 30 percent off their orders today, so use the code “TC” during checkout to get your discount. Check it out.